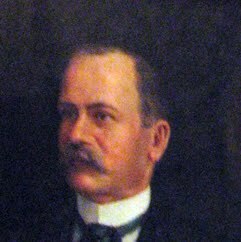 Albert Pickett Morehouse was the 26th Governor of Missouri from 1887 to 1889. Morehouse was born in Delaware County, Ohio and moved to Maryville, Missouri in 1856. He was admitted to the bar and began practice in Montgomery County, Iowa. At the beginning of the American Civil War, he moved back to Graham, Missouri where he taught school. He joined with the Missouri State Militia in November 1861 consisting of residents of Nodaway County, Missouri. While camped in Lafayette County, Missouri he met his future wife Mattie McFadden. After the war he formed a law practice with Amos Graham. In 1872 he founded the Nodaway Democrat which would become the Maryville Daily Forum. He was elected to the Missouri House of Representatives in 1876 defeating H.M. Jackson by 197 votes. He was to actively pursue legislation to establish a Normal school in Maryville that eventually would result in Northwest Missouri State University locating in the town. He was elected to the state house again in 1872 and was elected Missouri Lieutenant Governor in 1884. As Lieutenant Governor, Morehouse assumed office on December 28, 1887 upon the death of John S. Marmaduke.